Eccentric Amblings and Ramblings From Gnat Bottomed Towers: It's that bloke off the telly! The life and adventures of a mildly dotty old bird. It's that bloke off the telly! Perhaps you have seen the recent BBC2 series called "The Victorian House"? I watch so little TV that I think I might have caught a trailer for it and thought vaguely that I might catch up with it, but clearly hadn't done so when I spoke to this very friendly chap at the Repair Cafe. 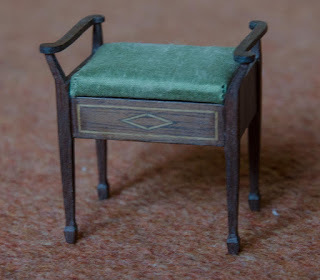 It transpired that this fellow is another local cabinet maker and I was admiring the photo of the Sussex Chair he'd made [you can see where I'm going with this can't you!] and when he asked me if he could pop by one day and see the my stuff for real [it's a step up from the photos] I readily agreed. We've shown many people what we do over the years. Still not having a clue who he was that's how I ended up with Abi popping in to GBT on Friday! What a lovely fellow he is. Mr GBT and he enjoyed an hour of talking woodworking tools, techniqes and workshops. That chair he completed on the programme took two solid nights of no sleep and working through to complete! Purely by chance Mr GBT had just finished his latest piece so he was the first person to see it.....at long last the lady of the dollshouse can sit down in all her finery and play at the piano. Hello there and welcome to my little bloglet. I am a mildly dotty dame who sees the world from a rather quirky angle. A lover of adventures, I enjoy a spot of church crawling, eco volunteering, folklore and social history. Greenmen and Morris dancing feature heavily here along with a goodly splash of colour and a wonderment at the small details in the everyday that so often get missed. If this sounds your cup of tea please pull up a chair. The kettle's always on and the cake tin full. Over on the building site.